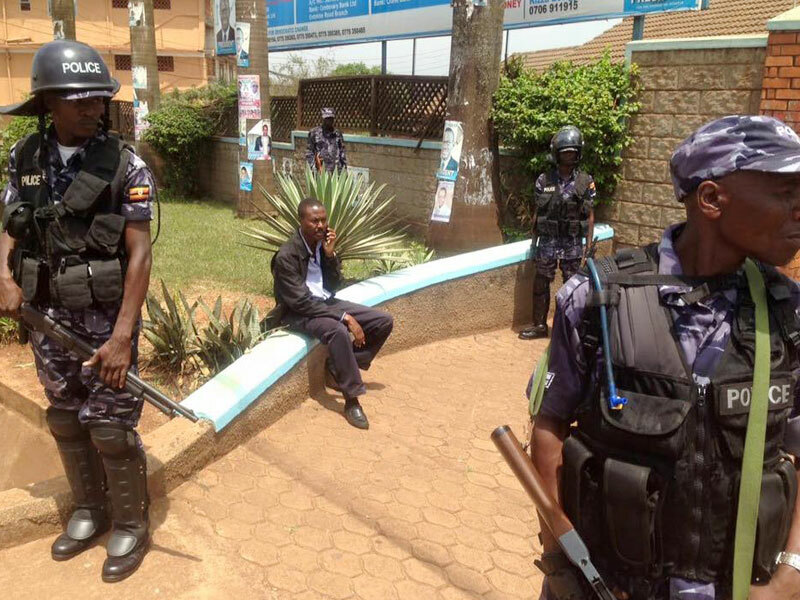 FDC president Mugisha Muntu makes calls during Police raid on FDC headquarters in Najjanakumbi last year. Police have raided FDC offices at City House in Kampala and arrested five of the opposition members. Police spokesperson Asan Kasingye told PML Daily that he was not aware of any such raid or the reason for it. Those arrested include Kizza Bakasembe Abdallah from Kawempe Robert Mayanja of the Jobless Brotherhood, Ayub Kigongo, Nasur Dean Basalirwa and Katumba from Nakasero market. The FDC Secretary for Defence, Sadiq Amin, who had briefly moved out to buy airtime, has also reportedly disappeared. Party officials say they do not know where those arrested have been detained. The City House offices, adjacent Radio One along Wilson Street, are the party’s tactical centre where plans and activities for the party are carried out from. The five detainees are currently at CPS Kampala.